Garage: "Garage: No Garage; Parking Space(s): 2"
Lot Size: 6000sq. ft. 50ft x 120ft "Corner, Rectangular"
Welcome to 416 Souris Avenue! This home is a steal of a deal! 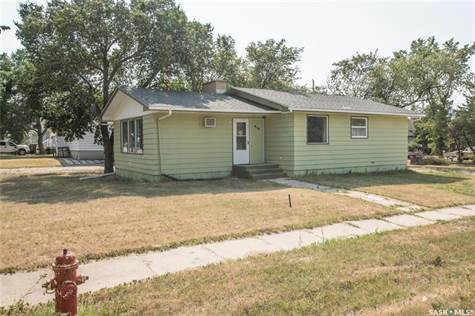 With 3 bedrooms and 2 bathrooms, the home is built on a corner lot with great space to occupy. The main floor includes a large living room with plenty of natural light, an eat-in kitchen and additional updates in the 4-pc bathroom. The seller stated the hardwood was done in recent years as well as some other upgrades, including shingles and a new boiler system to heat the house! All appliances included in your purchase. Located approximately 41 kms south of Regina, Wilcox is best known for being the home of the Athol Murray College of Notre Dame. An excellent opportunity to own in this well known community that boasts a fantastic elementary school and the small town peaceful atmosphere!